Following four nights of riots across the UK, Lincoln residents took to social media websites to voice their concern of similar action possibly taking place within the city. 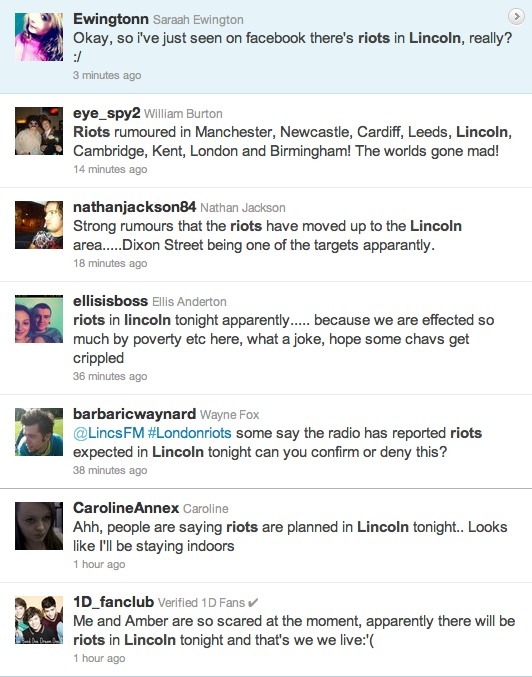 Messages of possible looting and rioting within Lincoln first surfaced on Twitter just before 7pm on August 9, despite no rioting or looting actually taking place. Lincolnshire Police confirmed there were no public order incidents in Lincolnshire related to the ongoing national disturbance issues last night. However, a number of users on both Facebook and Twitter quickly started speculating, commenting on purported rumours and possible riot targets. A minor number of updates on social media detailed how Dixon Street, St.Marks and the TK Maxx store on Tritton Road could see looting. These updates, which some users slammed as scaremongering, turned out to be rumours and completely false. As the night went on the growing rumours resulted in the early closure of city centre bar Walkabout. The Australian-themed bar was evacuated and closed at around 10PM. This action was described as “overly cautious” by one Twitter user. Lincolnshire Police confirmed one support unit was deployed to assist Nottinghamshire officers late last night, once it had been established that their presence in Lincolnshire was not required. That team has now returned to Lincolnshire. One Lincolnshire Police Support Unit continues to support Met officers in London. MP for Lincoln, Karl McCartney, commented on the recent riot action in London and across the country, calling it “sickening”.